Where Do I Schedule My Meetings and Events? In the world of Microsoft Office 365, there are several services that provide the ability for people to schedule interactive audio video sessions. They provide similar functionality in some cases, but they are meant to be used for different audiences. Today we will break down what your options are to help you better understand which tool you should be using for each different audience type. If your goal is to schedule a collaborative meeting with attendees participating in the discussion, then you have a couple options today. Skype for Business has allowed people to schedule and join interactive audio video conferences for years. Once inside a conference meeting, you can share your screen, files, whiteboards, PowerPoint presentations, and more. It has been the go-to for many organizations over the years to allow their staff to collaborate with others remotely. These types of meetings had a maximum participant count of 250. However, Microsoft has put it on the back burner and has shifted its focus to a completely new application as a fresh start. That brings us to Microsoft Teams, which is a complete reinvention of how to best collaborate and communicate with others. The latest and greatest technology for audio and video processing has been developed using Microsoft Azure Media Services. The features you enjoyed previously from within Skype for Business have been brought over to Microsoft Teams. Microsoft Teams does still have the same participant limit as Skype for Business at 250. When broadcasting content to a large audience to consume instead of collaborating, your features will be slightly different. The goal is to get that content out as fast and seamless to people with only a small number of interactive features. Skype for Business and Microsoft Teams both allowed up to 250 people to meet at once, but if you are intending to broadcast to a larger group, then you need to use a different solution. Skype Meeting Broadcast was the first solution to allow organizations to surpass the previous max of 250 participants. It incorporated a similar interface that people were familiar with from Skype for Business. If you are sensing a trend that anything with “Skype” in its name in Office 365 is not being actively developed anymore, then you are correct. Skype Meeting Broadcast is still supported for the time being, but support will be ended at some point in the future as Microsoft transitions to new solutions. 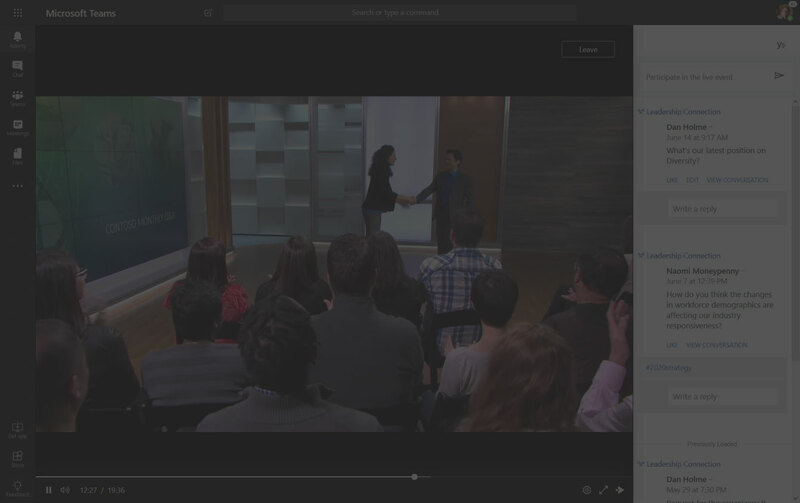 The latest and greatest large broadcast solution from Microsoft uses the same technology from Microsoft Teams meeting using Azure Media Services. Microsoft Stream is their solution to a corporate YouTube that allows organizations to store and organize all their video assets. I strongly recommend it to people looking for a place to store their videos, as you can integrate with it from SharePoint Online, Microsoft Teams, and more. Not only can you store recorded videos, but you can now create Live Events that will record as the event is occurring and allow you to post for consumption after it has ended. 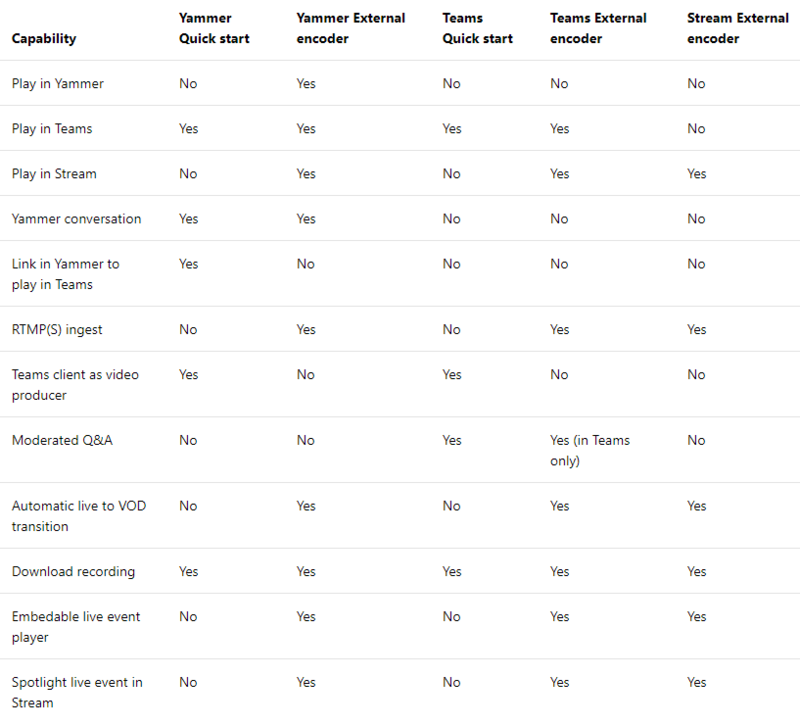 These live events can be scheduled from within Microsoft Stream, Microsoft Teams, as well as Yammer. The back-end technology that is creating the seamless stream is the same Azure Media Services as well as their new Azure Content Delivery Network, regardless of the method you use. The comparison table below showcases the feature similarities and differences based on service type and event type. This can help you make the right choice when it comes time for your next collaborative meeting or broadcast event. If you’re ready to get started with collaborative meetings and/or broadcast events using Skype for Business, Microsoft Teams, Microsoft Stream, or Yammer, then Imaginet is here to help. Our Imaginet certified Office 365 experts can help you get started with any of your communication and collaboration initiatives. To find out more, schedule your free consultation call with Imaginet today.